How wonderful it is to start getting ready for the weekend, leaving all of that huge errand list aside and taking a few minutes to forget the world and dream a little? 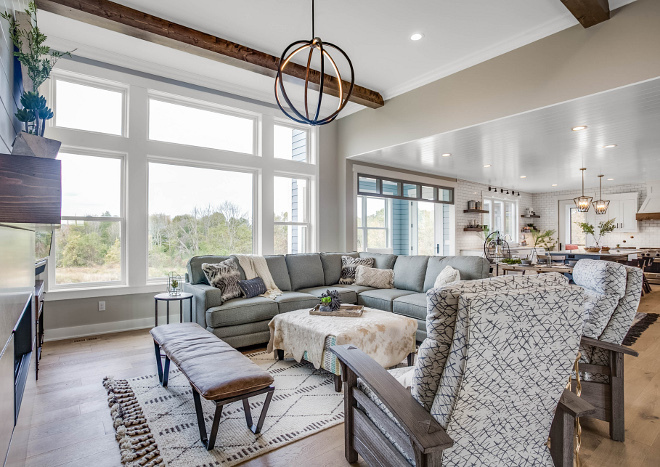 I am happy to be sharing some relaxing interiors that seem to invite you in and make yourself feel right at home. 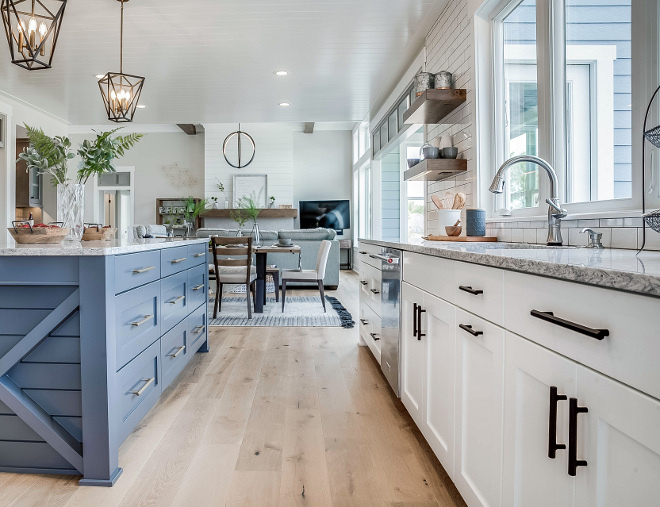 Many of these beautiful spaces were designed by some talented people I personally admire, such as Riordan Signature Homes, Brandon Architects Inc., Patterson Custom Homes and CVI Design, LLC. Take notes on the many sources shared and allow yourself to have some serious fun! 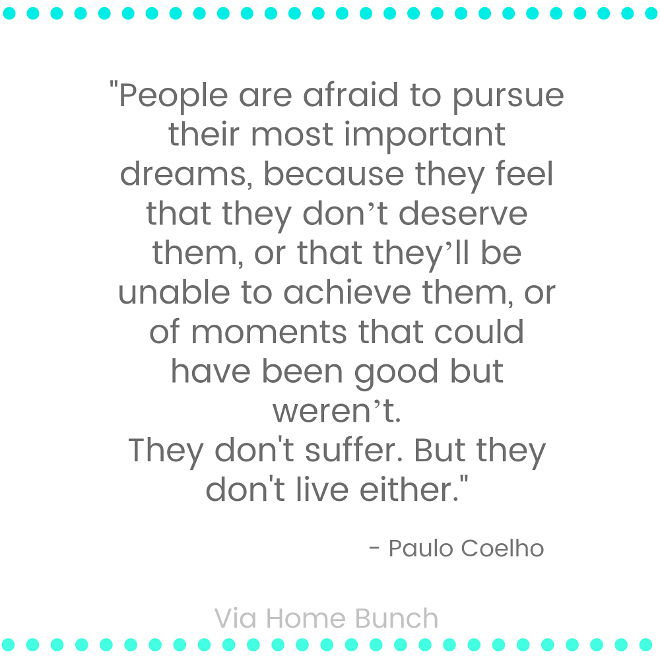 You deserve that. Inspiring front entry. Isn’t it welcoming? Notice the planters and the custom house number. Gorgeous foyer with high ceiling and ocean views! 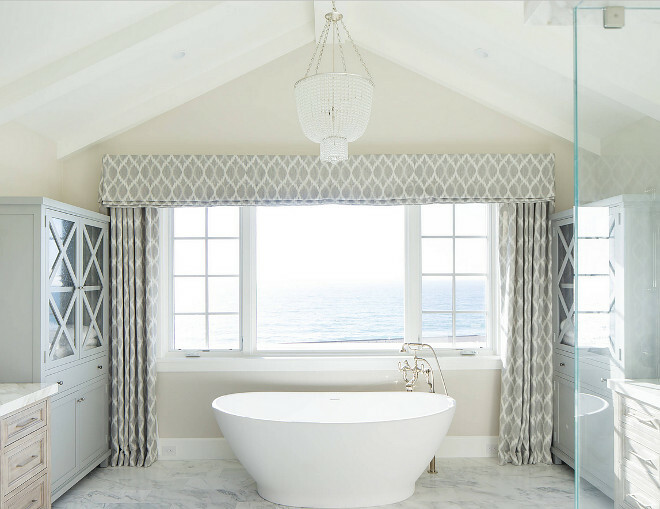 Paint color is All White by Farrow and Ball. High ceiling foyer with cathedral ceiling, exposed trusses and Dutch-door. 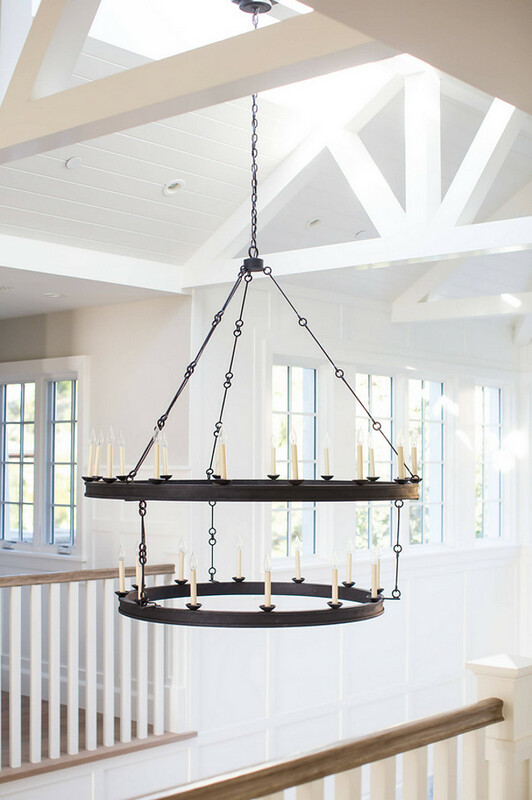 The foyer features a two-tier chandelier from Linden Rose & Co. Similar can be found here. 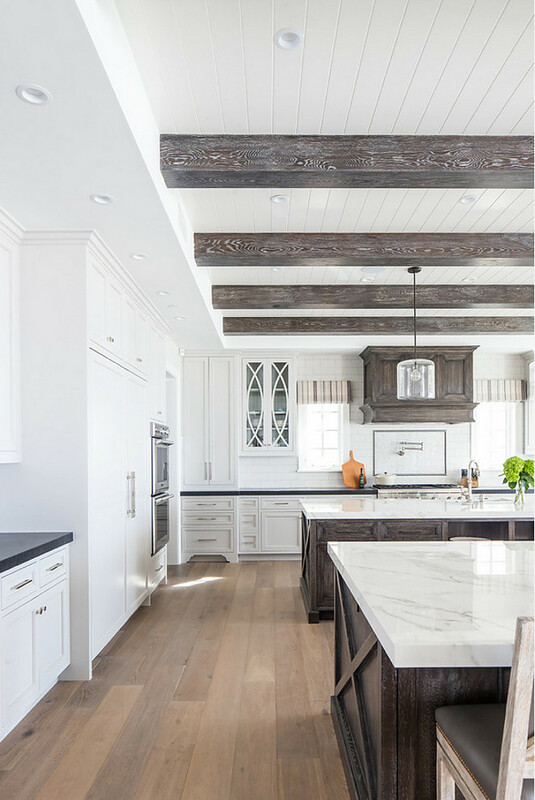 Spacious kitchen with two dark stained White Oak islands. 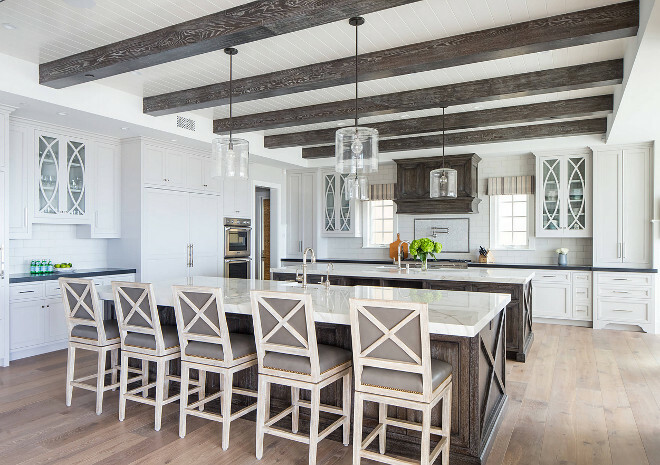 Kitchen ceiling features tongue and groove and stained beams. Similar clear glass pendants can be found here & here. 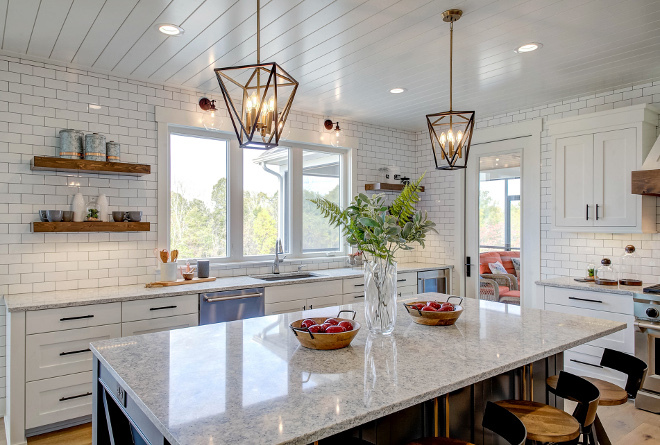 Beautiful breakfast room with Visual Comfort Morris Lantern. Similar Dining Table: here, here, here & here. 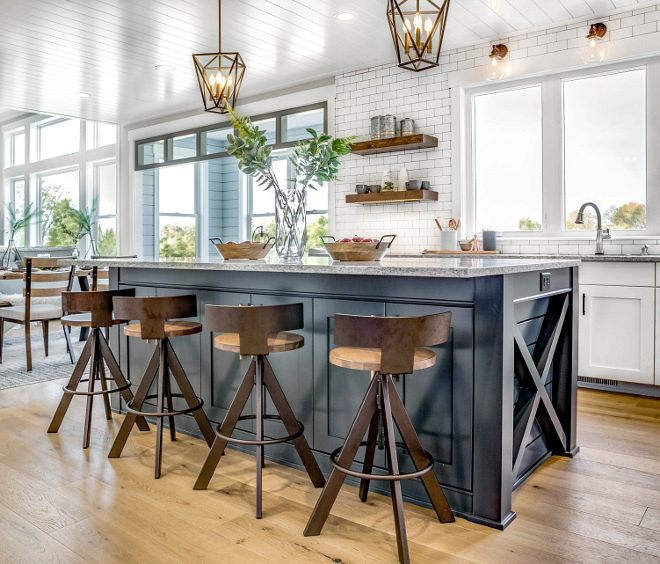 Similar Dining Chairs: here, here, & here. 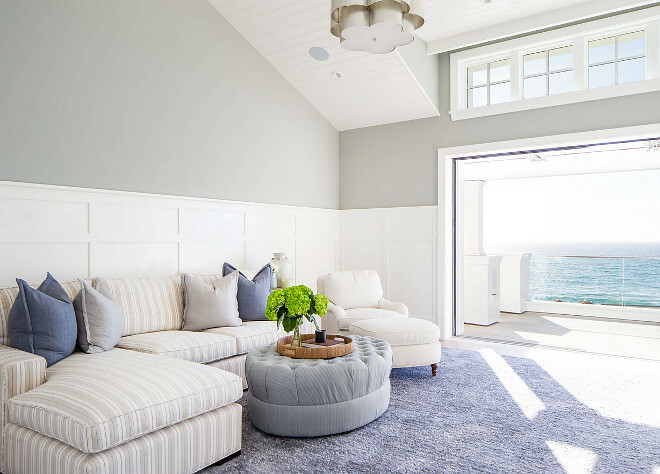 Airy and breezy living room with ocean view. 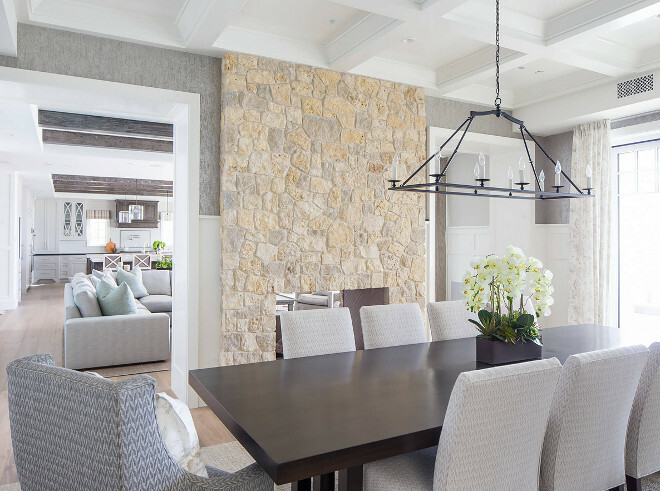 The kitchen and family room opens to a dining room with two-sided stone fireplace. 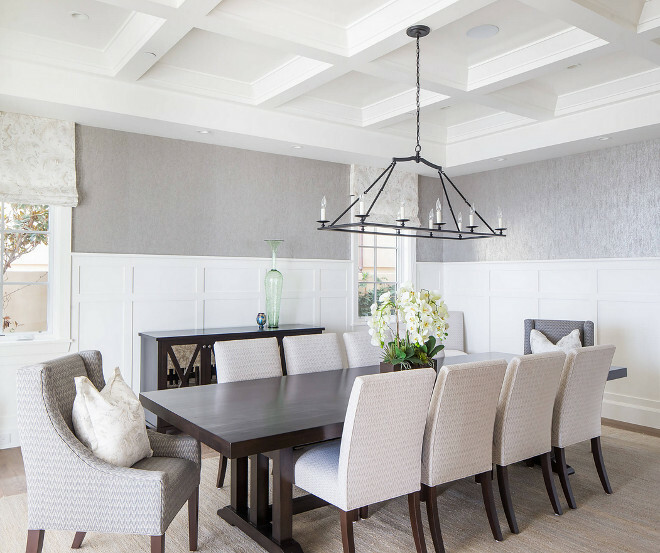 Similar linear chandelier can be found here. 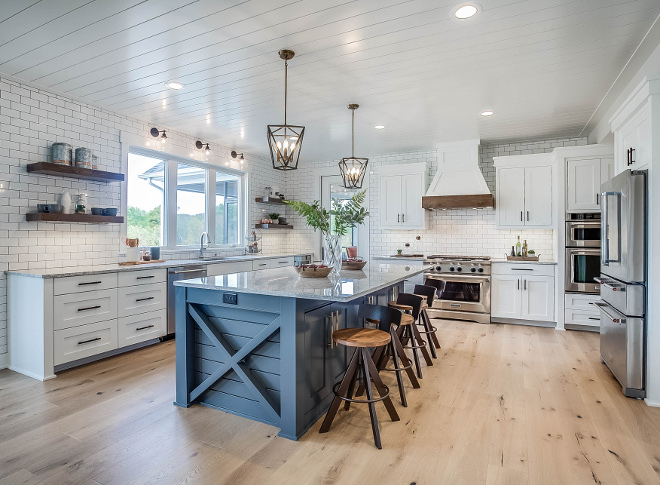 This farmhouse kitchen features a navy blue island, painted in Benjamin Moore 1360 Ocean Floor. 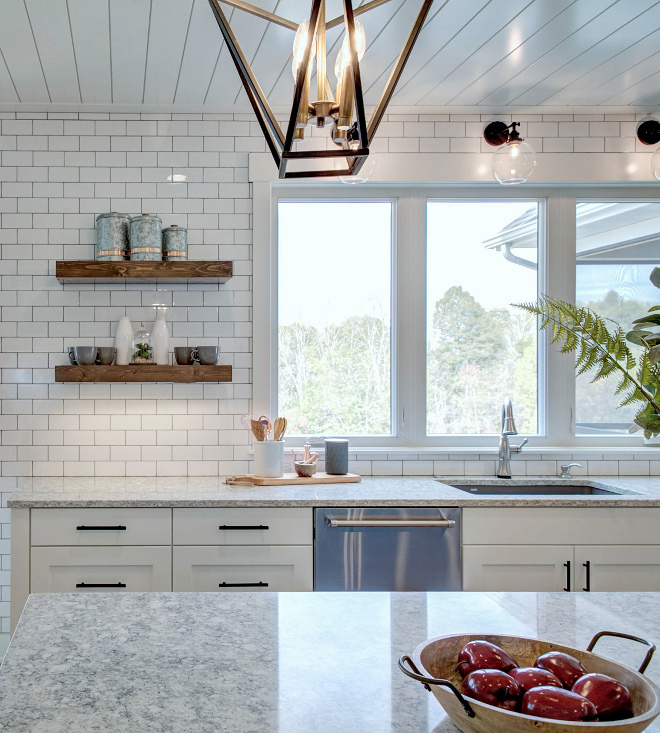 Backsplash is a white subway tile. Open Shelves: Fabricated Rustic Pine with Smooth Finish, Stained VIAW Natural Walnut. 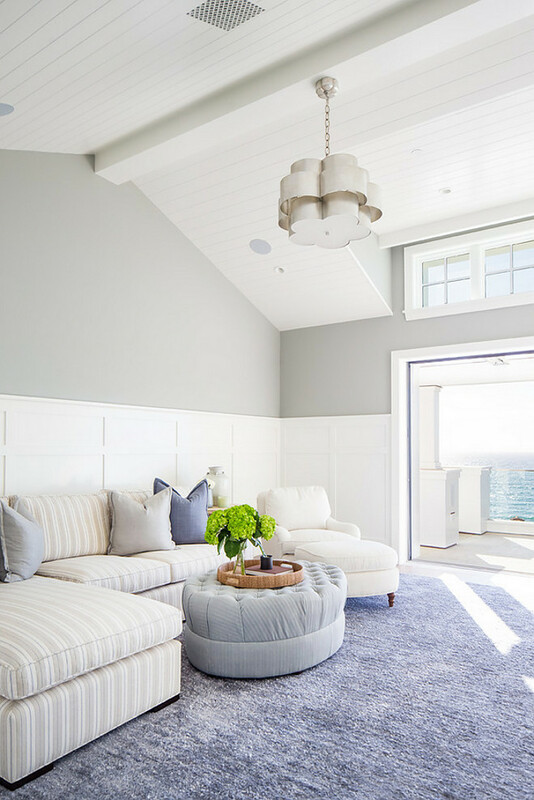 Ceiling: White shiplap painted in Sherwin Williams Pure White. 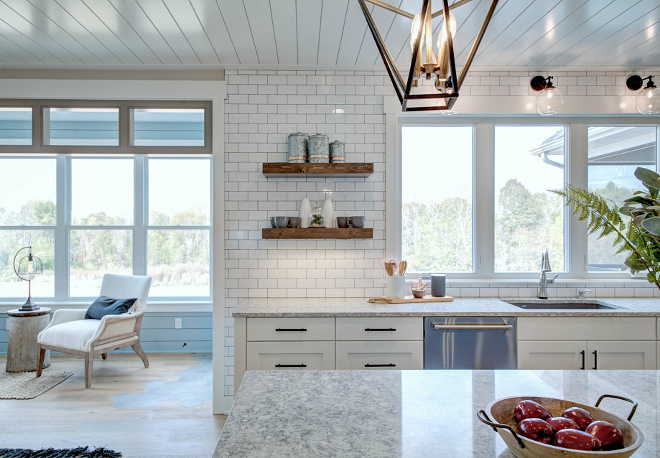 The side of the island features a “X” design and shiplap. 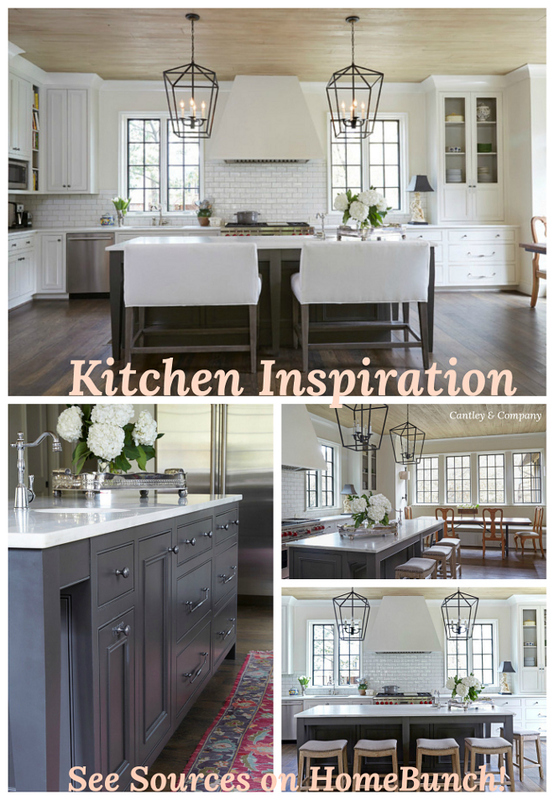 Kitchen Island Dimension 4′-4″ Wide x 8′ Long. 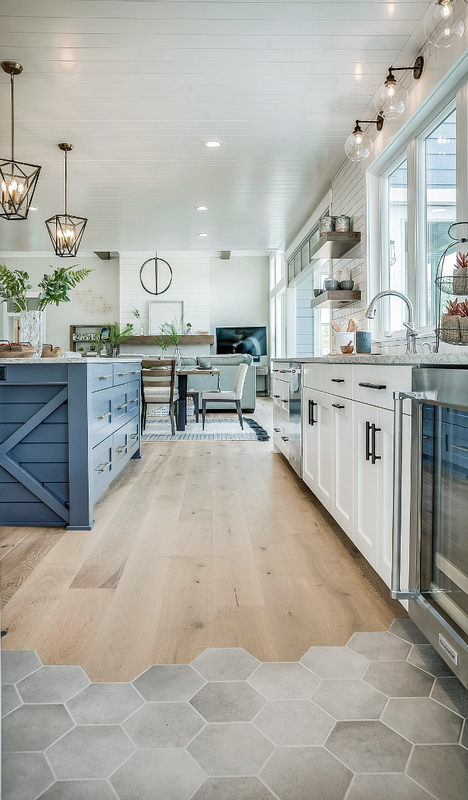 Flooring is Ragno Hexagon Tiles and River Shores Wood Floor. 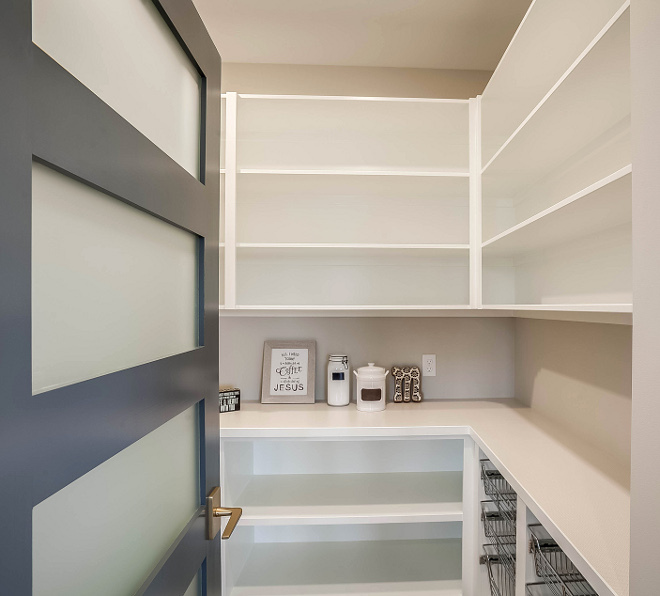 Door Style: Square flat panel. Pantry door painted in Benjamin Moore 1630 Ocean Floor. 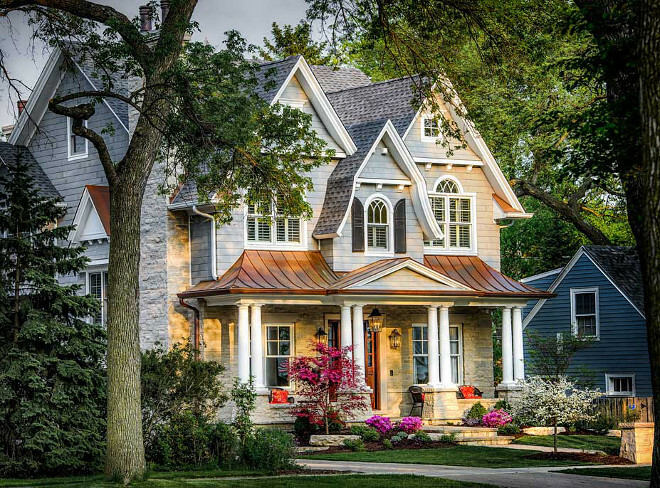 Isn’t this home beautiful? 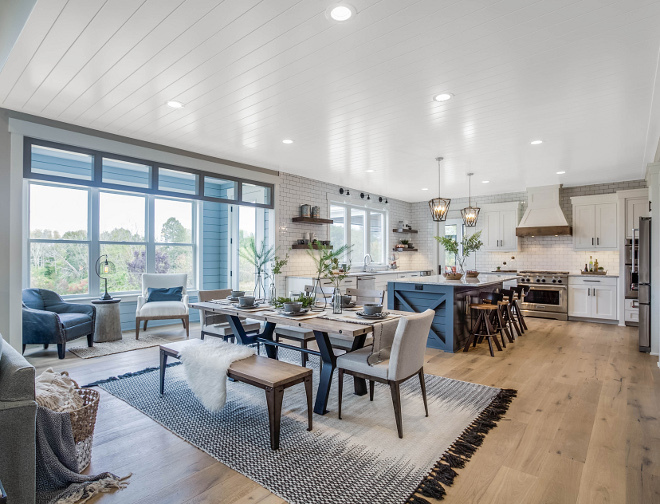 I love this open layout. 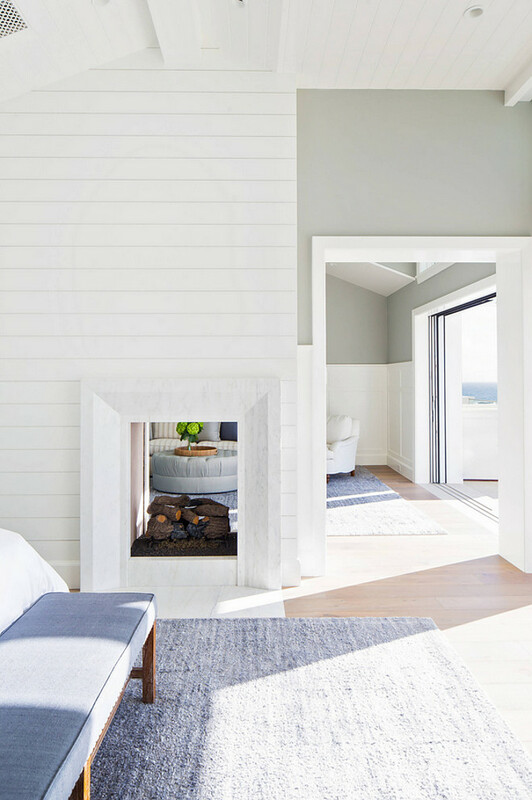 Notice the sitting room with shiplap. Similar Rugs: here & here. 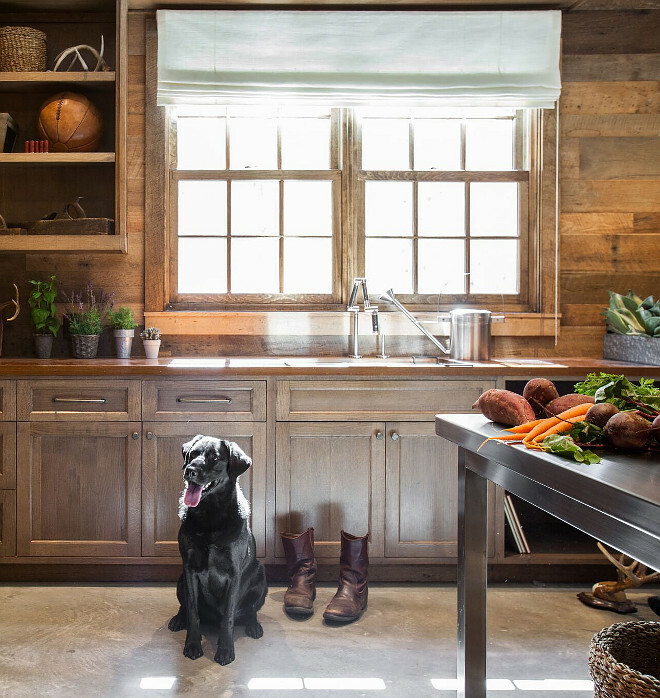 Farmhouse Dining Table: here, here & here. 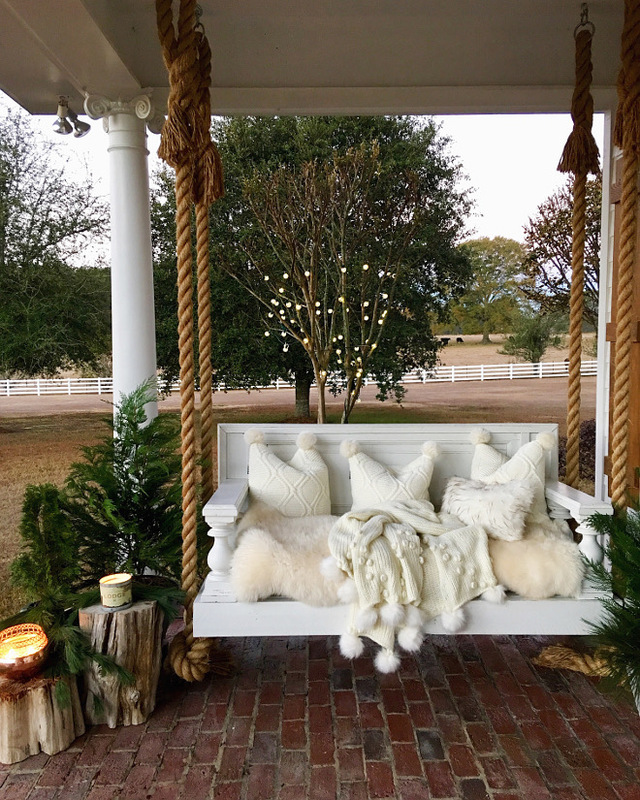 Farmhouse Dining Bench: here, here & here. Leather Bench: here & here. 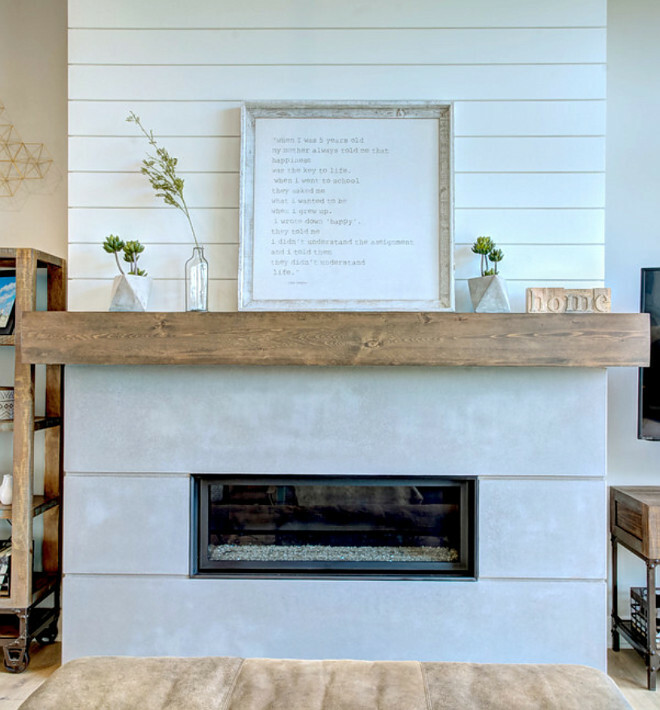 Fireplace features shiplap trim, Pine Barn beam mantle and Limestone hearth. 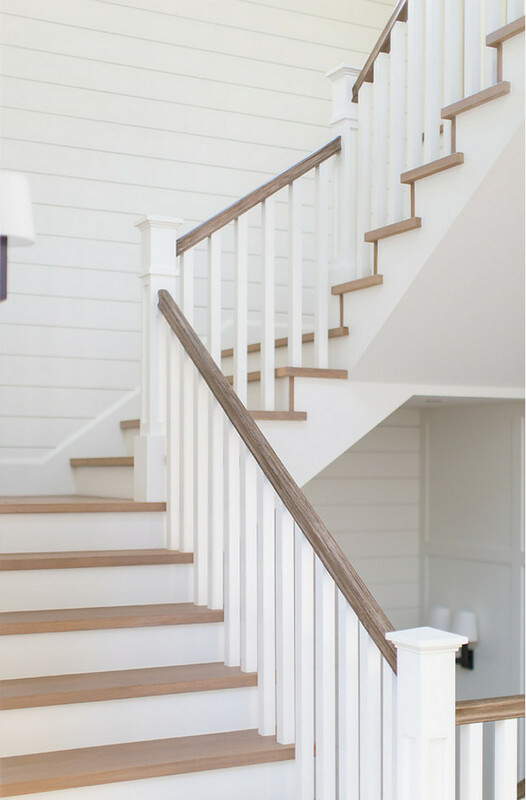 Staircase features White Oak railing. 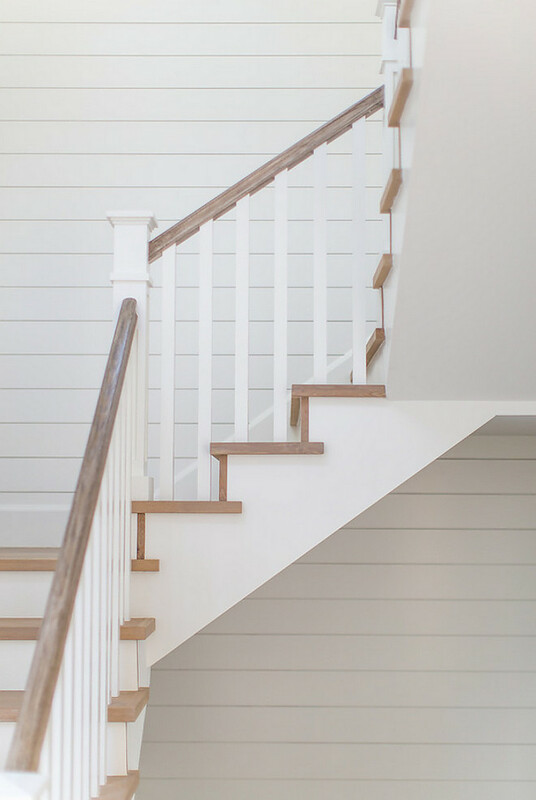 White Oak staircase treads with shiplap paneling. 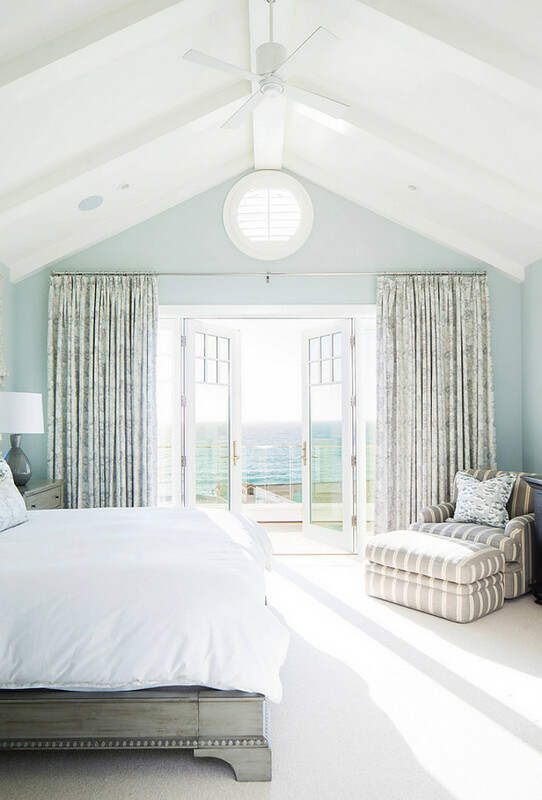 Bedroom features an inviting window-seat. 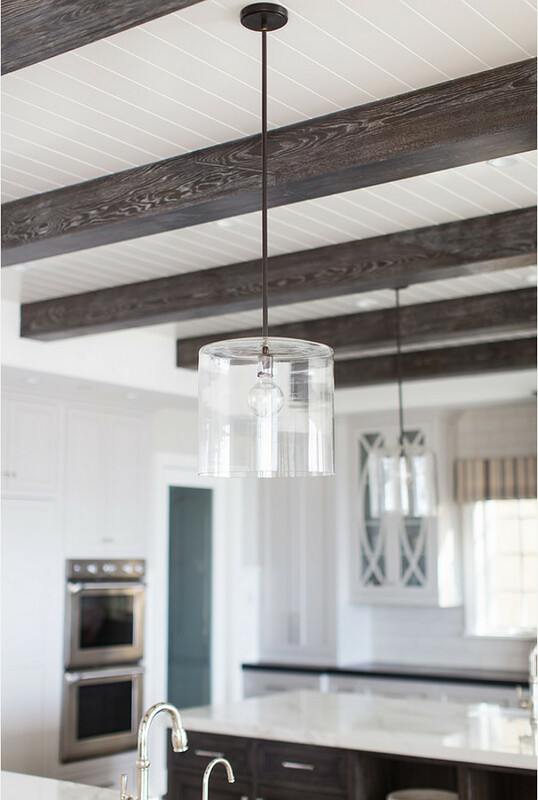 Lighting is Visual Comfort AERIN Arabelle Pendant. 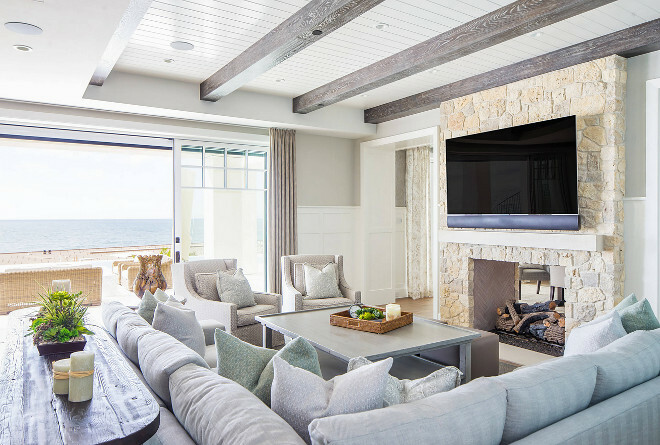 This space features grid board and batten paneling and a dreamy view. 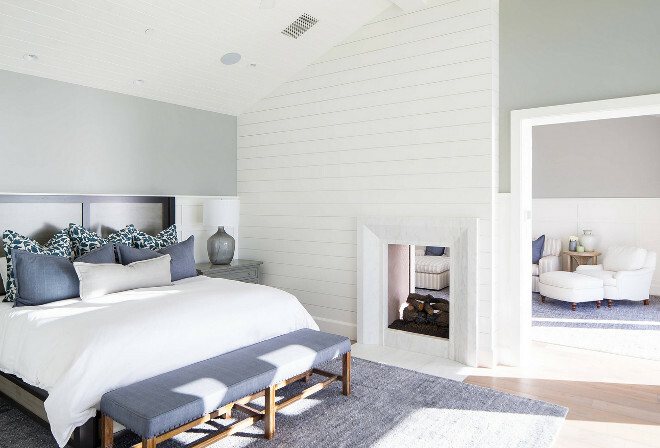 A two-sided fireplace separates the master bedroom to the sitting area. Jute rug can be found here. The bathroom vanity is stained white rift oak. 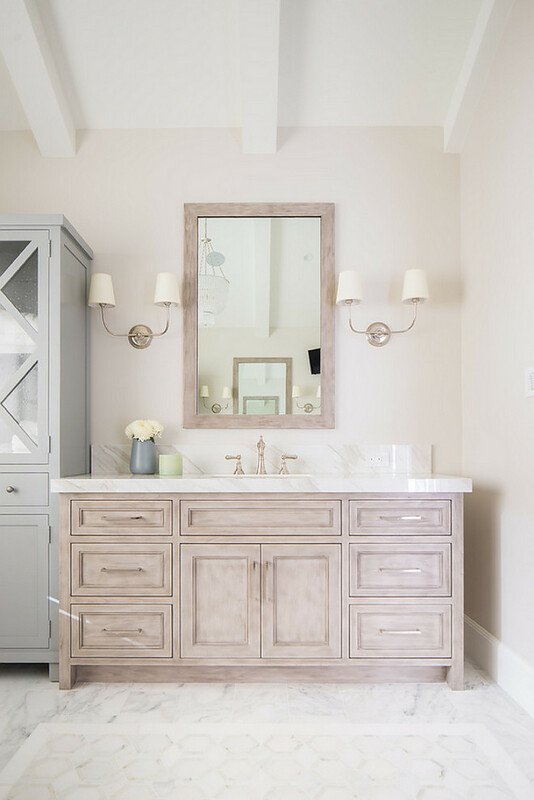 Sconces are Visual Comfort. 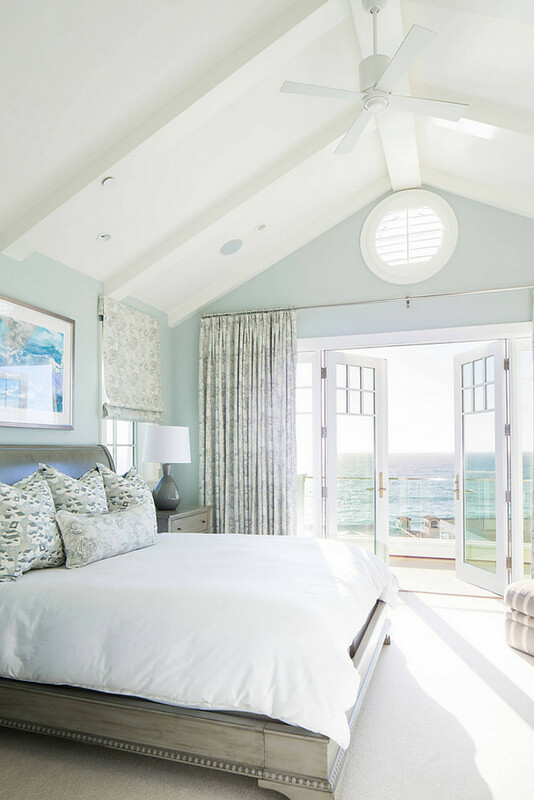 This stunning bedroom features vaulted ceiling and a soothing color palette. Similar bed can be found here, here, here & here. Similar lamp can be found here. 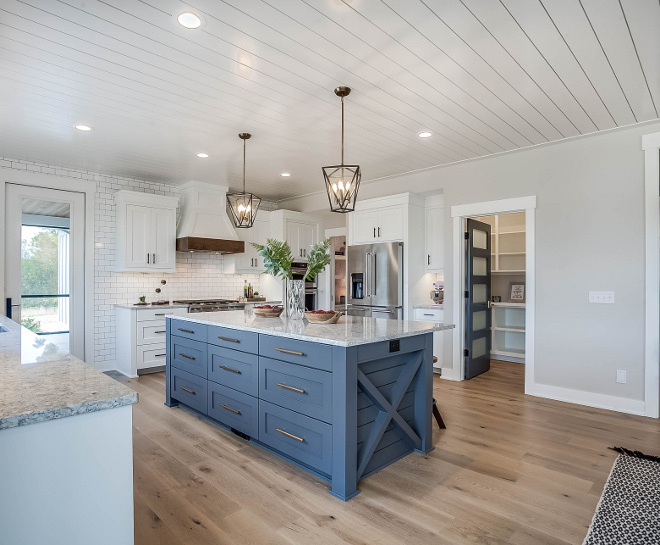 Board and batten paint color is Benjamin Moore Sail Cloth OC-142. Garden potting shed with reclaimed shiplap walls.